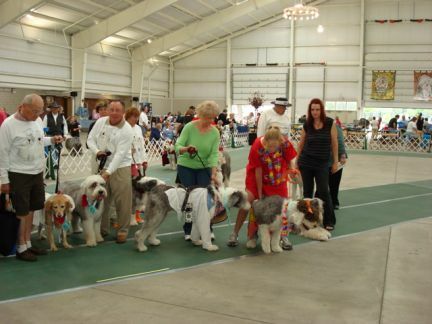 The Parade will be held on Wednesday, September 26th at the Kern Pavilion in Frankenmuth, Michigan, as part of the OESCA National Specialty. The Parade will follow the Sweepstakes competition (around noon last year). Anyone with a rescued OES or OES-mix is invited to attend. You do not need to be an OESCA member to participate and there is no entry fee. 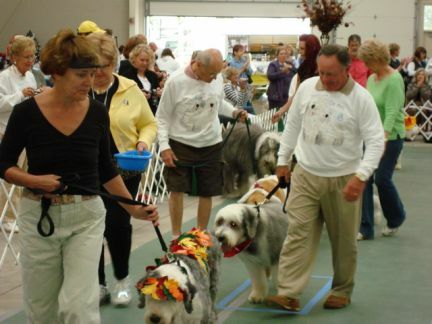 There are tote bags filled with goodies and ribbons for all participants and special prizes for the best costume (Octoberfest theme), longest distance traveled and the rescue group with the most entries. I was privileged to assist with the Rescue Parade the past two years and considered it to be the highlight of those shows. 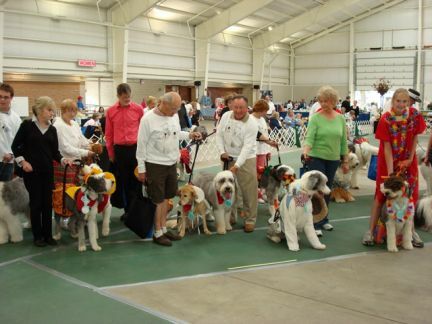 Some dogs and handlers appear in costumes but it is not required. All have stories that have inspired everyone and brought tears to the eyes of most that witnessed them. 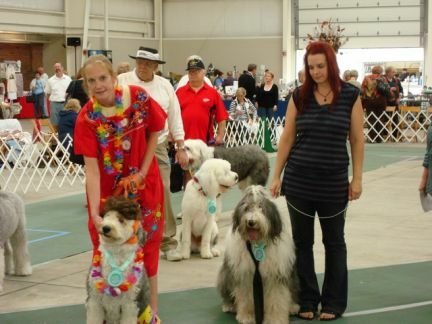 And, the rescues get more applause than the conformation dogs! Please PM me for an entry form. They must all be submitted to OESCA by September 19th, 2007. Hope to see you in Frankenmuth!!! I can't wait to see the rescue parade!!! I have the camera ready to go for that!! YIPPIEEE!!! 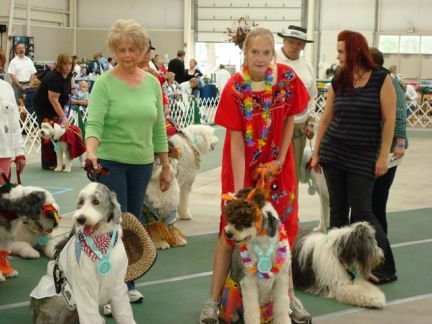 The Rescue Parade at the 2007 National Specialty was an overwhelming success! Thanks to all the participants for showing off their dogs but especially for opening their hearts and making a difference in their lives through rescue. This year the Parade's top prizes rivaled the best stuff won in the conformation ring. 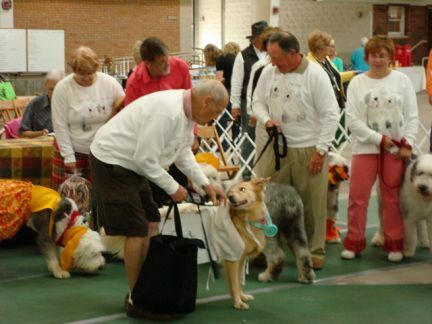 Everyone got a great tote bag filled with things for dog and owner plus an award ribbon just for participating. Max in his cowboy costume and Clyde looking bored.